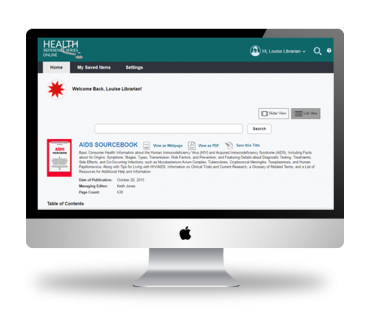 A subscription to Health Reference Series Online provides ongoing online-only access to all current and future publications in the Health Reference Series and Teen Health Series collections. Designed for individuals with no specific medical knowledge, this easy-to-use and authoritative source provides basic medical information for patients, families, caregivers, and the general public. Users will find the volumes to be excellent resources for reference, research, and personal information. Health Reference Series Online allows users to access these valuable resources however and whenever they want on multiple devices including tablets and smart phones. Natural Language Search engine that allows users to search in and across volumes and to take advantage of the suggested searches provided to them based on their own search terms. Click here to signup now and get your first month free. "A valuable medical research resource for public libraries and primary or secondary school libraries. It may also serve as a basic reference for career and vocational schools."